So in addition to the walker caddy tutorial I’m sharing at Skip to My Lou today, I also made a velcro-on hanging cup holder tutorial to share with you. 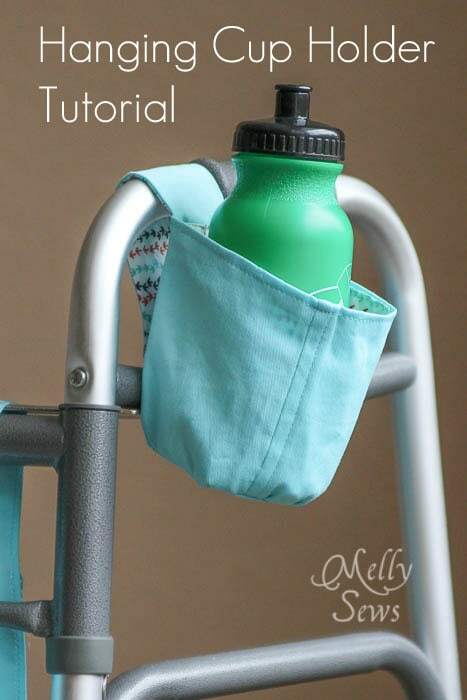 This is great for Granny’s walker, but could also easily work for a stroller missing a cup holder. 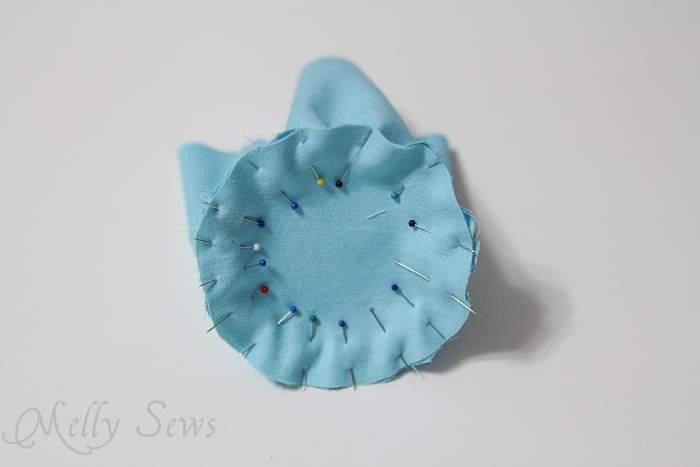 Trace out a circle that’s as big you want the holder to be, then add at least a 1/4″ seam allowance. Measure around the circle. Cut a rectangle piece that is the same length as the circumference of the circle plus a seam allowance. Sew the rectangle into a tube, then pin it to the circle around the bottom. Stitch. Repeat with the lining fabric, so you have two cup shapes. Iron the top edge of each to the wrong side 1/2″. With the sturdier main fabric right side out and the lining fabric wrong side out, place the lining inside the main fabric. Cut two rectangles for the hang tab – mine were 2″ x 5″. 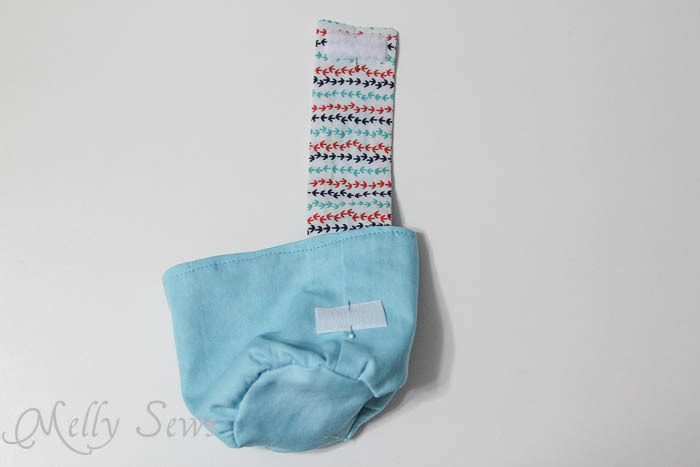 Sew them around both long and one short side, right sides together. Turn the tab right side out, press, and sandwich between the lining and main fabric cups. Topstitch around the top edge, securing the tab and closing all raw edges inside. 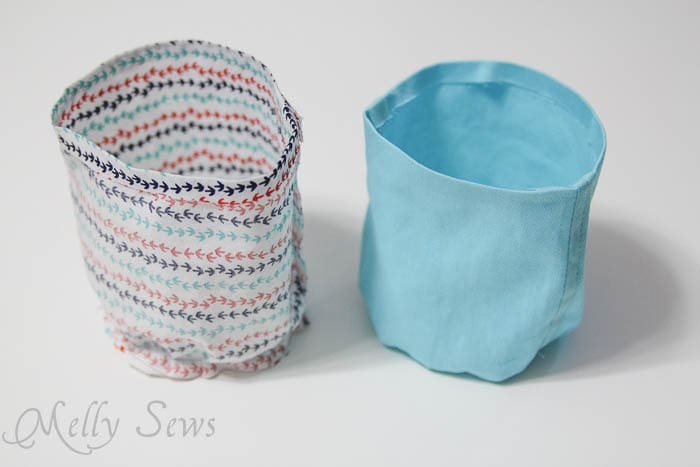 Add sew on velcro to the tab and the side of the cup. Stitch in place and you’re done! PS – this is super similar to how I made my Toy Storage Buckets, and that post has more pictures of the process that may help you. Thank you for sharing this tutorial!! My grandfather used a walker in his last years, and he had one of those caddies. I’m not sure how he could have gotten around without one. When both hands are on the walker, there are no hands free to hold a newspaper or a remote or anything else you’d carry from one room to the next. Thank you for showing how to make items that are of such service to people, and also for the sweet memories that your tutorial brought to mind on a cold, yucky, sleety morning. I was inspired by your tutorial to make a walker bag for a friend who fractured her pelvis in a fall. I used a print fabric that was one way directional, so I had to make some changes so the birds wouldn’t stand on their heads. It turned out great and I know she will like it. I just finished it about an hour ago. Thanks. I am going to do a cup holder or two for some others that may need them. It sounds so easy. Thanks for your information. Love your blog. I am going to make a lot of these for the people at the assisted living facility. They will love it! I made my mother this cup holder and she really liked it. My mother is 90 years young and uses her walker all the time to get around. I plan on making one for my neighbor also. Thanks for the tutorial. I made mine deeper for a larger bottle or item…. This would also work great with crutches and hooking it on the handgrasp part. Car keys, small wallet, etc would fit in it! Thanks! This would be great for a shopping cart too 🙂 I like getting a coffee early Sunday morning to sip while I grocery shop but there’s never anywhere to safely stow it while I bag my fruits & veggies! Thank you for the pattern 4 cup holders are bottle holders for a walker or wheelchair. I have been looking for a long time to find a cup holder that will not break. I was looking at your website and noticed that you had the Walker bag and the cup holder and thought to myself that would make a great cup holder for my wheelchair. It won’t get broken and I could turn it either way either inside or outside on the arm of my chair thank you again for your willingness to share your patterns with us. Thank you Melly! This something that can be made out of scraps ! I had a beauty shop at a nursing home for 8 years ! They are always looking for gifts for bingo. And extra gifts at Christmas ! I have lots of scraps and I am ready. Thanks for the idea. 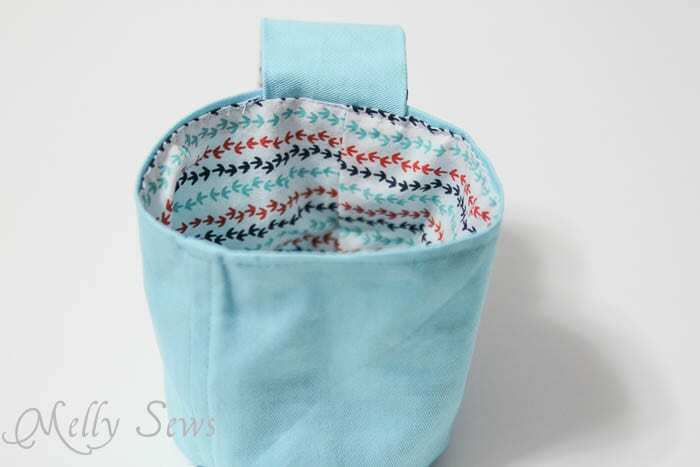 I am going to share your post with all my sewing friends. My husband bought a tri glide 3 wheel Harley a few years ago and I didn’t have a cup that would fit the holder so I made a holder to hold a large cup or what ever I was wanting to take that would fit in it but I put elastic around the top and Velcro to fit over the ring of the holder to attach to sides and it worked out great it is time for me to make another one for this summer when we ride . my daughter in law had me to make her one . Now I have to decide how I want to do my new one . I love everything that you make . Thanks A BLUE MILLION !!!!!! Thank you so so much for this free tutorial. I made a walker caddy for my stepfather who just had his knee replaced and he absolutely loved it! I added a narrow pocket for a pen holder as well. I’m on a fixed income, so finding free patterns and being able to use fabric I already have is such a blessing! I used KC Chiefs and red Oly fabric I had on hand and it was perfect! 😊. I also plan to make some to donate to those in need. Again, THANK YOU 🙏🏻 and God Bless! I’m 85 years old and need a walker since I broke my hip. I am going to use this idea for my cell phone which I take with me always. Tjanks for sharing.